There is no stronger remover of cement based grout residue or water borne mineral deposits on the market. Use "Grout Residue Remover / Brick and Block Cleaner" diluted, but you can increase strength as necessary to get the job done. Watch for etching effect on grout if used at greater strengths. You are treating something that is not the (mineral/cement/efflorescence) substance you thought. There is a sealer or other coating that is keeping the GRR from contacting the white stuff. Test a drop of GRR on another cement surface guaranteed to never have been sealed. A concrete sidewalk is a good test. Note the degree of fizzing there compared to your surface. If the grout (mortar) or tile (brick, stone, etc.) has been sealed, it is keeping Grout Residue Remover / Brick & Block Cleaner from reaching the surface. Use lacquer thinner or Aldon Premium Stripper on a small area to see remove whatever might be there. If the GRR fizzing reaction is greater after that, you have your answer. Does not seem to be working well enough? If it fizzes, it is working. If the deposits are thick or deep in crevices, it might take multiple applications and perhaps at full strength. Light scrubbing action can aid the process, but let the chemical do the work - not the brushing. One application doesn't remove it all? It might take multiple applications. Light scrubbing action can aid the process, but let the chemical do the work - not the brushing. When the fizzing stops, the reaction is done and that amount of cleaner is exhaused. Clean off and apply more GRR. If there is no fizzing reaction, the deposits are something else not made of cement. This is usually an additive in the grout and what you see is "additive bleedout". Look for words on the grout container like: "modified", "poly...", "additive", "acrylic", "latex", etc. Grout Residue Remover works on the cement portion. For the additive portion, try lacquer thinner. If lacquer thinner has some effect, but is too weak or slow - Aldon Premium Stripper is much more aggressive at breaking down those type additives. No fizzing, or just a little fizzing, and the cleaning/removal effect is minimal? The minor fizzing part of what you see is contact with a little bit of minerals, but the uneffected balance might be a degrading sealer that comes apart looking white and powdery. This is a different chemical component and requires an additional formula type. As above with the issue of "polymer additives", most sealer types that degrade in this manner will "melt" with lacquer thinner. You can use lacquer thinner to remove that portion of the problem, or our Aldon Premium Stripper to make it easier. Too much suds? Could be too much scrubbing or water is too soft. Perhaps you are using "softened" water. This produces a higher sudsing effect on soaps, detergents, etc. The product has components that are cleaners and help in the overall process. Try water from an outside hose bib as that should never be on a softened water line. The chemicals break down the grout residue without the need for scrubbing. A scrub brush is good for moving it around and aiding the process, but actual scrubbing is not needed. Excess scrubbing could create sudsing. A white residue remains when dry? It is not the product. It could be - Cleaning solution was allowed to dry on the surface and the dissolved cement paste is left behind. Try again and wipe clean before it dries. It could be - Rinse water contains minerals that are left behind and are visible when dry. See "Problem Solving" for mineral deposits. 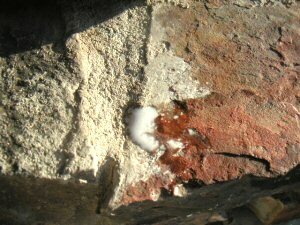 It could be - "efflorescence" caused by water soluble minerals carried to the surface by heavy rinsing. 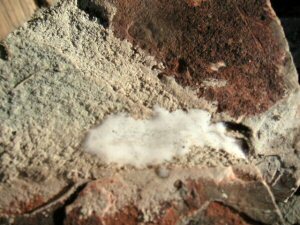 See "Problem Solving" for efflorescence. It could be because of "Sand Stabilizers": If remaining white looking stains do not respond to Aldon "Grout Residue Remover" (fizzing), this might not be efflorescence. Sometimes an installation might have a "sand stabilizer" mixed in with the sand. These are basically glue type materials. This glue can wash out and leave light colored smears on the pavers. Test lacquer thinner and/or Aldon Premium Stripper to remove this glue. When you seal with an Aldon sealer, choose one that will stabilize sand at the same time and you will get that stabilizing effect in a single step without the same risk. If this does not answer your situation - something is very different and unusual. You should be able to discover why by looking elsewhere in "Problem Solving"